Transport for London is satisfied that the Uber taxi app is operating within the law, despite protests from legions of the city's black cab drivers. The mobile ride-sharing app is free to continue operating within the city, according to TfL, which rejected cabbies' claims the app's driver's should be licensed because of the way they calculate fees. In a statement to the TFL board, MD of Surface Transport Leon Daniels said: "In relation to the way Uber operates in London, TfL is satisfied that based upon our understanding of the relationship between passenger and Uber London, and between Uber London and Uber BV, registered in Holland, that it is operating lawfully under the terms of the 1988 PHV(L) Act." Drivers use smartphones to meter fares rather than traditional taximeters and as a result "have no operational or physical connection with the vehicles, and [so] … are not taximeters within the meaning of the legislation," Daniels said. The ruling comes after London black cab drivers brought attempted to bring the capital to a standstill with a strike last month. TFL's decision isn't the end of the matter. Whether smartphones can be classed as taximeters will be decided in a British court next month. 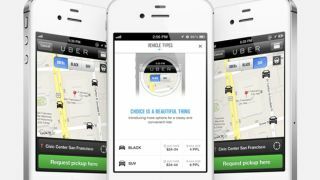 For now, Uber drivers are free to go about their business.